Would you look at mightwar go? For only about the 2nd time in my life, I made some New Year’s Resolutions. One of my goals was to produce a weekly music post using tracks from my record collection. I was all overcome by the WordPress love when I came up with that one and there were serious second thoughts about editing it out from the original post. But then on 4th January (Bam! Pow!) The Listening Booth was launched – on time and looking pretty decent for a first attempt. In your face 2013! I’m so excited that I’m hyperactively doing the Running Man. OK. Technically if you could see me, you wouldn’t be able to tell what I was doing; what with the constant body tremors … but in my mind, I am busting some serious moves. The gauntlet is well and truly thrown and now, it’s up to me to pick it up and run with it (metaphorically speaking). 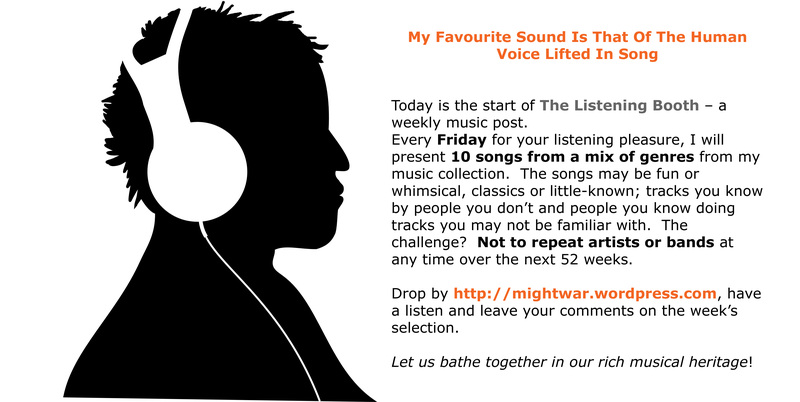 So feel free to drop by, have a listen and leave your comments on the week’s selection. To see how other bloggers responded to the challenge, see The Daily Post.